This movie wonderfully portrays the early life of Jane Austen, the author of Pride and Prejudice, which is one of the most famous novels of all time. Through this movie, I was able to experience what Jane Austen went through. 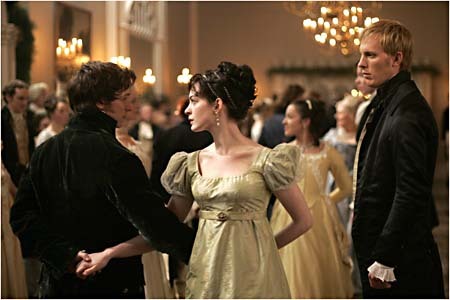 I have always known Austen as an author, but this movie changed my perspective of her, to another woman who wanted a true love. Also, the wonderful acting done by Anne Hathaway and James McAvoy makes the life of Jane Austen fascinating and touching. This historical film has earned a variety of awards including the 2007 People’s Choice Award for “Favorite Independent Movie” and the BAFTA-winning Scottish actor for James MvAvoy. To me, this movie has more than one meaning. Not only does this movie portrait the life of Jane Austen but it also shows the life of typical female authors. I have always wondered about the life of this female author, born in 1800s. In her most popular book, Pride and Prejudice, first published in 1813, Jane Austen portrays female life in the Victorian era. During the Victorian era, people, especially in bourgeoisies, significantly valued their reputations. In Pride and Prejudice, readers can clearly see the existence of Victorian ideas. In addition, I believe that there is a significance in the title of the movie, Becoming Jane. The title character is the author that we know. Before she becomes a real author, she is just a typical girl seeking love. However, she sacrifices this dream in her quest to be come a writer. As she gives up her desire to find love, her mind becomes hopelessly filled with beautiful stories and writings. Her passion toward writing novels grows stronger with each passing day. I was able to understand her feelings when she was writing her novels. Before I watched the movie, I thought that just knowing and understanding the works of an intelligent author were important. However, I realized that understanding the life of the author is also, significant and rather help one to understand the author’s work.